I don’t have any tattoos. Maybe you do. I have known friends be delighted with them and have them have deep meaning for them. Others have spen good money getting them slowly lasered away. Others just sort of forget that they are there but can recount to you the story of when and where it came to them. Other tattoos might have the ceremony and ritual and power to embed into you how you belong to where you are from. Not just where you are from but that you belong to there. 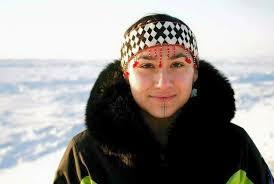 Marjorie Tunaq Tahbone is Inupiaq and lives in Alaska. The traditional tattoos of these people were outlawed by missionaries in the 1800’s. A few people still carried on the tradition. But as modernization and the impact of poor resourcing, forced boarding schools, poverty, and forgetting rumbles across indigenous communities the tattoo was vanishing. This tradition was used to cinch a connection between the human and non-human worlds and to honor spirits and ancestors. Now it is being revived by many but certainly by Tunaq to help heal from traumas done through colonization and to more strongly claim their place in the world. The old ceremony of the tattoos was that women were the tattooists and would do the ritual on people at important and transitional moments in their lives. Though the Inuit also had the tapping ink into the skin method that we know, the oldest method for tattooing was to take a strand of tendon from a seal and make a thread from it. Then they would make an ink by burning seal fat and mixing the waxy soot and ash into a paste. The word for seal fat is ‘nanuk’ meaning ‘light’. Then they would dip the thread into the ink and with a bone needle they would draw the thread through the chin. They would carry the dark light on their faces, knowing that the seal would help them find their way in the world. Then they would dance to tell the story of how they found themselves where they are in the world by the rhythms of a drum made of the stomach of a walrus. The people who are receiving these tattoos report a sense of being claimed by the land and their ancestors. Of being sustained by that which sustained their people and in turn they feel a deep responsibility towards these seals and walrus and bear and sky and water. To know that there are some other people in the world who are trying to keep these life affirming paths walked on is pretty fine. And to know that a different approach to using the the literal fat of the land in placing your self in relationship to the land is pretty beautiful from a Primal Derma eye. But might it be that you’ll find a way to be placed a little bit by the life around you and be claimed a bit more. If you need some tallow from us to help remind you and take care of your skin a bit – we’d love to help.